I assume you’ve filled out a paper form with a pen, and circled one or more of the options presented on the form. Can this be done in a PDF form as well? For a scenario where more than two buttons need to be part of such a group, or for a more flexible approach, I modified the script presented in the AcrobatUsers.com post. Create a PDF file containing just the “circle” (or the oval) you want to use to circle the options in your form. You can do this in e.g. Adobe Illustrator or Adobe Photoshop. Make sure that the inside of the circle/oval is transparent, otherwise you will not see the selected option “through” the circle. On the “General” tab select to make this button read-only and hidden. Again, we are only using this first button to store the icon image, so there is no need to show this button to the user, or let the user interact with it. I am calling this button “icon”, if you select to change the button name, keep in mind that the same name needs to be used in the button action script below. On the “Appearance” tab set both the border color and the background color to “transparent”. This setting also needs to be applied to the other buttons we will add to this form. 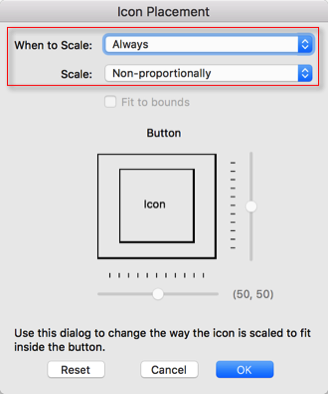 On the “Options” tab select to use an “icon only” layout, and set the “Behavior” to “None”, then select the PDF document that contains your circle/oval icon from above. 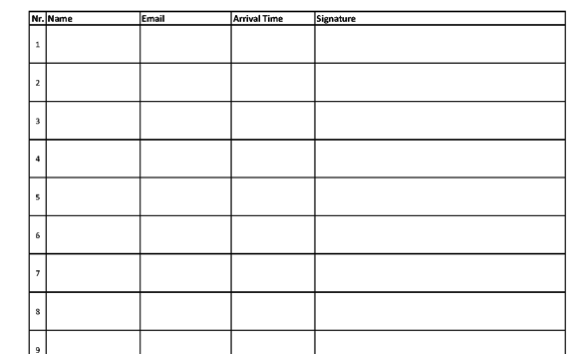 Now add the other buttons to your document that we will use to select options on the form. For now, I am only considereing one group of buttons called “Button1” – the individual buttons in the group will have names like “Button1.Opt1”, “Button1.Opt2” and so on. 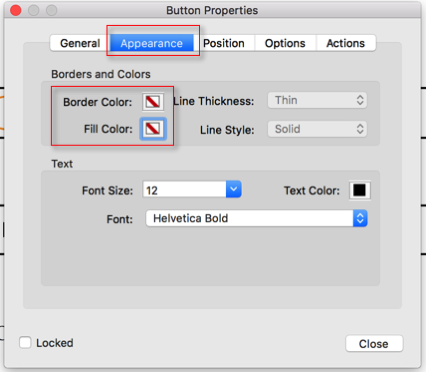 You can use any descriptive name for the last part of the button name, as long as it does not contain a period. This script will set the button that you clicked on to use the surrounding circle/oval as it’s button image, and it will remove it from all other buttons in the same group. You may notice that we never actually make assumptions about what these options (or the button names) are – it’s all handled automatically. 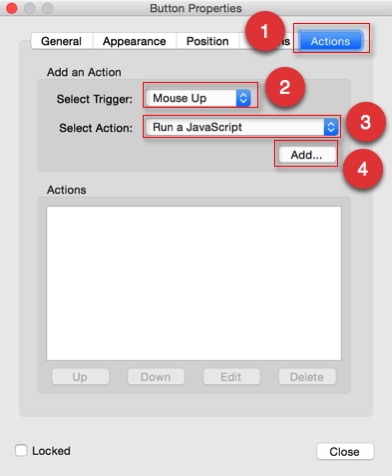 For this to work, the form needs to be recalculated whenever a button is pushed. This does not happen automatically, that’s why we are calling the ‘calculateNow()’ method at the end of the button action scripts. 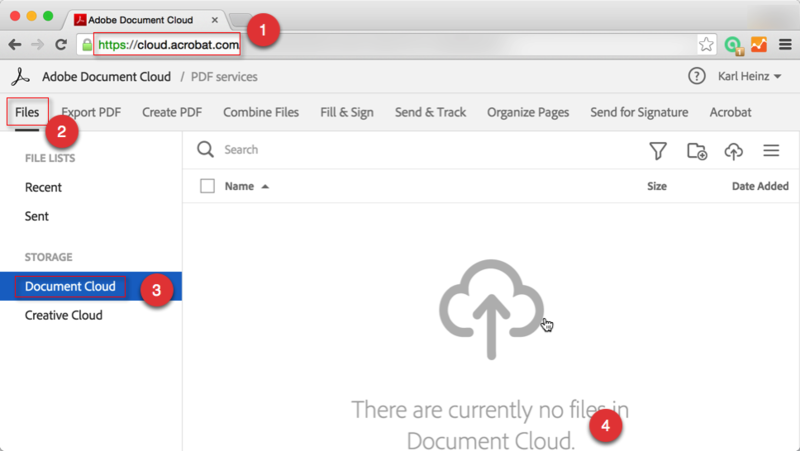 Adobe Acrobat’s File Open or Save Dialogs are Slow or Hanging – Here is the Fix! In Adobe Acrobat DC, the operating system’s file dialogs are replaced by Acrobat’s own dialog that allows you to pick a file from the recently used list, from Adobe’s online services “Document Cloud” and “Creative Cloud”, other online storage solutions (e.g. Dropbox, Box, OneDrive and SharePoint sites), and finally files on your local system. It takes time to connect to all these online services to see if they are available, and if one is slow to reply, it may actually look like the dialog is hanging completely. 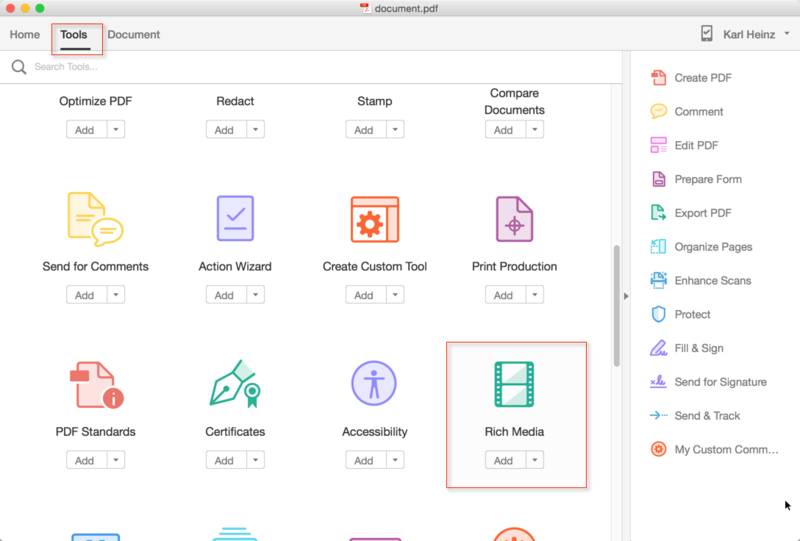 Once this change is made, Acrobat will use the operating system’s file selection dialog directly. This also means that the online storage services are no longer available via an almost one-click access method. It would be nice to have a way to select which dialog comes up by default, and be able to bring the other one up when necessary without having to go through the Preference settings. If this is something you want to see, join me in filing an Enhancement Request for Adobe Acrobat. The actual web service running on a server. When I say “server’, I use that term in a very broad sense, and that could mean that you run the software on an actual server (running e.g. Windows Server, Mac OS Server, Linux, ..) or on a normal workstation that is running server software. You can install for example the free XAMPP software on a Windows 10 computer and still get the same behavior as you would with a real server system. This means that this feature is only available in the free Adobe Reader if “Forms” rights are applied to the document. Even though Adobe Acrobat can apply some extended Reader rights to a document, for the “Forms” rights, the LiveCycle Reader Extensions software is necessary. For the purpose of this tutorial, the presented solution will only work if you are using Adobe Acrobat (version 6 and later) and not the free Adobe Reader. The solution we want to create is a form that has at least two fields: One that will eventually contain the form number – or serial number – and one that contains the name of the person filling out the form, or the name of the person the form was created for. In addition to these two, the form can contain any number of fields. We also need a mechanism to request a new serial number – in the sample below, that will be done using a button. When a new serial number is generated, I also want to store the user name and the current time and date so that I can go back later and find out what documents were processed and either by what user, or for which customer (depending on how I use that user name field). To make things easier on the implementation in the actual PDF form, let’s start with creating the web service that provides these unique numbers and stores information about the request to generate such a number. This web service should provide a function named “getSerialNumber()”, which takes one argument (the user name), and returns a string containing a new number. Web services can be written in any number of languages. Oftentimes web services are written in Java and are then executed in an application server like Apache Tomcat. For this sample implementation, I selected a web service written in PHP. This has the advantage that it will run on Windows, Linux, Mac OS, and any other system that provides support for PHP. The XAMPP system mentioned above does come with a PHP interpreter and Apache’s web server configured to use PHP. Setting up a web service in PHP based on just the documentation is not straight forward, and I found a lot of help here: A Complete PHP SOAP Server Example If you want to understand more about how all these pieces are working together, you may want to spend some time on that site. The big question now is how can one create a unique and sequential number? I am going to use a database for that: When you define a field as the primary key in a MySQL database, you end up with such a unique and sequential number. For every new record, that index gets automatically incremented, starting with the value 1 for the first record. This assumes that a WSDL file named “GetSerialNumber.wsdl” is in the same directory as this PHP file, and this WSDL file in turn is referencing a schema file that also needs to be in the same directory. You can learn about how to manually create a WSDL file here: How to Generate WSDL for PHP SOAP Server – With a recent version of NetBeans, there is one more step involved that is not documented in the tutorial: You need to open the generated WSDL and replace “REPLACE_WITH_ACTUAL_URL” with the actual URL of your web service PHP file. containing the new serial number. It does that by calling the “getNextSerial()” function, which opens a connection to a MySQL database and inserts a new record using that user name and the current time and date. It then returns the index of the just inserted record. In the first step, we load the WSDL file that was installed with our PHP web service, then we get the contents of the “UserName” field and if that is a non empty string, we request a new serial number via the SOAP proxy object. We then take that result, interpret it as a number and format it so that it has leading zeros. The last thing we do is to hide the button that was used to generate the serial number. There could be more error checking and exception handling in this code, but I did not want to clutter up the actual functionality with that. For example, you need to check that the user name provided is not longer than 30 characters (that’s what we used to define the length of the VARCHAR field in the database table). these fields alone, and will not flatten them (a value of “0” will flatten them and a value of “2” will remove them from the document). This allows us to modify the document before we call the Doc.flattenPages() method: If we turn all fields that should not be flattened into non-printing fields, then flatten the document, and then in a last step reverse that first change, we can do flatten only a subset of fields. The problem gets a bit more complex when we already have non-printing fields in the document that we want to remain non-printing, or if we have non-printing fields that we want to flatten. That will require quite a bit of logic to save the original state of all fields, turn those fields we want to flatten into printing form fields, turn the fields that we don’t want to flatten into non-printing fields, flatten the document, and then restore the original settings again. As I said, a bit complex. Just to demonstrate how to flatten a whole document, I’ve added that as the last line in this snippet. This makes it very simple to e.g. define an array of field names to be flattened, and then just loop over that array, get the field, and flatten one at a time. Back then, the idea was that we would have a spreadsheet with rows of data, and every row would be imported into a new copy of the document (e.g. a mail merge type application). The blank spaces between the entries in the list above are TAB characters – remember, we need a tab separated text file for this to work. This is simple to do for a small files, but if you are dealing with 100 records of 10 fields each, we are talking about a pretty extensive row of data. It can certainly be done, especially if a VBA macro is used, but it’s not what I would do. var dataFile = "/Users/username/data.txt"; // !!! CHANGE THIS !!! // that correspond with the three columns in our data file. Here is the sample file I’ve used as Excel Spreadsheet and as tab delimited text file (this is random data thanks to the “Fake Name Generator“. There are a few potential problems when you are using this approach: First of all, the same limitations that apply to manually importing data apply here as well: You need to make sure that each column in your data file is represented by a field in your temporary file, and that the names match. There cannot be any extra fields either. And, in this particular case, you will have to make sure that you only import up to the same number of records that your document can actually handle. My document uses 20 records, so I am checking for that in my script. If you need continuation pages, you can certainly do that, it would make the script a bit more complex. If you want to adapt this approach for your own solution, make sure that you add all required fields to your temporary document. In the example above, I am only using text fields, but the same technique can be used for other field types as well. As you can see, the custom dialog that collects the data that will be placed as part of the stamp pops up after the stamp is placed. Once all information is entered, and the “OK” button (how that button is labeled is up to the stamp’s implementation) is pressed, that data gets merged into the stamp and the stamp gets displayed. From that point on, that data can no longer be changed. It’s like placing a rubber stamp on a piece of paper. Once it’s there, it can no longer be modified. There are however a few things we can do with a PDF stamp: We can move the stamp, resize and rotate it – as shown in the video. This article is not supposed to be a “tell all” story about dynamic stamps, I just wanted to demonstrate the basic workflow involved in placing a custom dynamic stamp. If you have questions about these types of stamps, please post in the comments. A while ago I wrote about missing characters after merging PDF files. Since then, I’ve heard about a few more instances of missing characters and was able to debug one scenario. The following is a record of that. Unfortunately, there is no simple fix for this problem, but more about that at the end. The second line in the printed output clearly is missing characters at the end. I had two reports about this problem, the common things were that both were using a Mac, and both were printing to network printers. The printers were from three different manufacturers, so it had to be something that crosses vendor boundaries. A while ago, Apple introduced AirPrint, a mechanism to print from an iOS device without a driver to an AirPrint compatible printer. AirPrint uses the IPP protocol and the URF format. To make things simpler for printer manufacturers, the same mechanism is oftentimes also used for printing outside of the AirPrint environment, e.g. when printing from a Mac to a network connected printer. And that is exactly where we are running into problems with these jobs. Mac OS X uses the CUPS system as it’s print sub-system. Apple actually purchased the the rights to CUPS back in 2007. By now, what’s in Mac OS X is not pure CUPS (which is still open source software), but a proprietary system built on top of CUPS. This makes it a bit harder to figure out what’s going on. D [27/Oct/2015:11:39:24 -0400] [Job 112] argv="EPSON_WF_3520_Series"
D [27/Oct/2015:11:39:24 -0400] [Job 112] argv="112"
D [27/Oct/2015:11:39:24 -0400] [Job 112] argv="khk"
D [27/Oct/2015:11:39:24 -0400] [Job 112] argv="parts_combined.pdf"
D [27/Oct/2015:11:39:24 -0400] [Job 112] argv="1"
D [27/Oct/2015:11:39:24 -0400] [Job 112] argv="AP_ColorMatchingMode=AP_ApplicationColorMatching AP_D_InputSlot= nocollate com.apple.print.DocumentTicket.PMSpoolFormat=application/pdf com.apple.print.JobInfo.PMJobName=parts_combined.pdf com.apple.print.PrinterInfo.PMColorDeviceID..n.=18333 com.apple.print.PrintSettings.PMCopies..n.=1 com.apple.print.PrintSettings.PMCopyCollate..b. com.apple.print.PrintSettings.PMFirstPage..n.=1 com.apple.print.PrintSettings.PMLastPage..n.=2147483647 com.apple.print.PrintSettings.PMPageRange..a.0..n.=1 com.apple.print.PrintSettings.PMPageRange..a.1..n.=2147483647 media=Letter pserrorhandler-requested=standard job-uuid=urn:uuid:68eacf38-6a65-3c4f-7a67-3e90cb0c7bc3 job-originating-host-name=localhost time-at-creation=1445960364 time-at-processing=1445960364 PageSize=Letter"
D [27/Oct/2015:11:39:24 -0400] [Job 112] argv="/private/var/spool/cups/d00112-001"
D [27/Oct/2015:11:39:24 -0400] [Job 112] envp=""
D [27/Oct/2015:11:39:24 -0400] [Job 112] envp="CUPS_CACHEDIR=/private/var/spool/cups/cache"
D [27/Oct/2015:11:39:24 -0400] [Job 112] envp="CUPS_DATADIR=/usr/share/cups"
D [27/Oct/2015:11:39:24 -0400] [Job 112] envp="CUPS_DOCROOT=/usr/share/doc/cups"
D [27/Oct/2015:11:39:24 -0400] [Job 112] envp="CUPS_FONTPATH=/usr/share/cups/fonts"
D [27/Oct/2015:11:39:24 -0400] [Job 112] envp="CUPS_REQUESTROOT=/private/var/spool/cups"
D [27/Oct/2015:11:39:24 -0400] [Job 112] envp="CUPS_SERVERBIN=/usr/libexec/cups"
D [27/Oct/2015:11:39:24 -0400] [Job 112] envp="CUPS_SERVERROOT=/private/etc/cups"
D [27/Oct/2015:11:39:24 -0400] [Job 112] envp="CUPS_STATEDIR=/private/etc/cups"
D [27/Oct/2015:11:39:24 -0400] [Job 112] envp="HOME=/private/var/spool/cups/tmp"
D [27/Oct/2015:11:39:24 -0400] [Job 112] envp="PATH=/usr/libexec/cups/filter:/usr/bin:/usr/sbin:/bin:/usr/bin"
D [27/Oct/2015:11:39:24 -0400] [Job 112] envp="SERVER_ADMIN=root@MacBookPro2013.local"
D [27/Oct/2015:11:39:24 -0400] [Job 112] envp="SOFTWARE=CUPS/2.0.0"
D [27/Oct/2015:11:39:24 -0400] [Job 112] envp="TMPDIR=/private/var/spool/cups/tmp"
D [27/Oct/2015:11:39:24 -0400] [Job 112] envp="USER=root"
D [27/Oct/2015:11:39:24 -0400] [Job 112] envp="CUPS_MAX_MESSAGE=2047"
D [27/Oct/2015:11:39:24 -0400] [Job 112] envp="CUPS_SERVER=/private/var/run/cupsd"
D [27/Oct/2015:11:39:24 -0400] [Job 112] envp="CUPS_ENCRYPTION=IfRequested"
D [27/Oct/2015:11:39:24 -0400] [Job 112] envp="IPP_PORT=631"
D [27/Oct/2015:11:39:24 -0400] [Job 112] envp="CHARSET=utf-8"
D [27/Oct/2015:11:39:24 -0400] [Job 112] envp="LANG=en_US.UTF-8"
D [27/Oct/2015:11:39:24 -0400] [Job 112] envp="APPLE_LANGUAGE=en-US"
D [27/Oct/2015:11:39:24 -0400] [Job 112] envp="PPD=/private/etc/cups/ppd/EPSON_WF_3520_Series.ppd"
D [27/Oct/2015:11:39:24 -0400] [Job 112] envp="RIP_MAX_CACHE=128m"
D [27/Oct/2015:11:39:24 -0400] [Job 112] envp="CONTENT_TYPE=application/postscript"
D [27/Oct/2015:11:39:24 -0400] [Job 112] envp="DEVICE_URI=file:/tmp/epson.out"
D [27/Oct/2015:11:39:24 -0400] [Job 112] envp="PRINTER_INFO=EPSON WF-3520 Series (to file)"
D [27/Oct/2015:11:39:24 -0400] [Job 112] envp="PRINTER_LOCATION="
D [27/Oct/2015:11:39:24 -0400] [Job 112] envp="PRINTER=EPSON_WF_3520_Series"
D [27/Oct/2015:11:39:24 -0400] [Job 112] envp="PRINTER_STATE_REASONS=none"
D [27/Oct/2015:11:39:24 -0400] [Job 112] envp="CUPS_FILETYPE=document"
D [27/Oct/2015:11:39:24 -0400] [Job 112] envp="FINAL_CONTENT_TYPE=image/urf"
D [27/Oct/2015:11:39:24 -0400] [Job 112] envp="AUTH_I****"
So, what’s going on? We start out with a PostScript file and run it through pstoappleps, which seems to “normalize” the PostScript to something that Apple’s other utilities can work with. The next step is pstocupsraster, which is the actual PostScript interpreter that converts PostScript to the raster image, which is where the problem occurs. And the last step is rastertourf, which takes the raster image and wraps it into the URF format. At the end of this script we end up with a URF file. In order to actually see what’s in the file, I convert that URF file to TIFF using the urftotiff utility from the urf_work project. We could also use Michael Sweet’s RasterView utility and look at the raster file before it gets converted to URF. I created a set of HTML files that I ran through wkhtmltopdf, and then merged in Adobe Acrobat into one PDF. Such a file, when printed to any printer on Mac OS that uses the tools mentioned above to convert PostScript to a raster format, will very likely show missing characters. My theory at this time is that when a certain CID font is subset embedded on multiple pages with different subsets, the Mac OS X PostScript to URF toolchain will not correctly interpret the subsets on each page – somehow it gets “stuck” with one subset, and if a page uses characters that are not represented in that subset, we end up with missing characters. Now that we know what causes this problem, is there anything we can do about it? Unfortunately, because most of the functionality is in Mac OS X proprietary files, we cannot fix the problem. All we can do is work around it by printing “as Image”, and wait for Apple to fix it on their end. I’ve tested this on both Mac OS X 10.10 (Yosemite) and 10.11 (El Capitan) with the same results. As many of you know, I am very active on the Adobe Acrobat User Community (http://www.acrobatusers.com). Oftentimes it’s necessary to actually see a PDF file in order to help somebody with a problem. 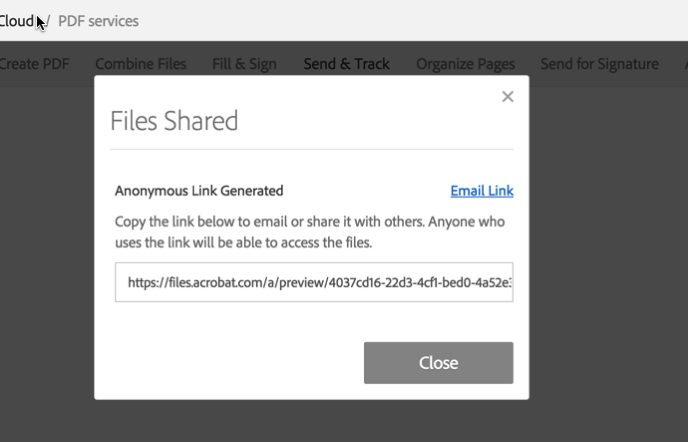 There is no file sharing mechanism built into AcrobatUsers, which means that in order to share a file, it is necessary to use some other sharing service. One such option is Adobe’s own Document Cloud. The following shows how to upload a document to the Document Cloud, and to share it. When you sign up for your Adobe ID, you get a Document Cloud account that comes with storage space. If you have a subscription to Acrobat DC, you get 20GB of storage, with a free account that is not connected to an Acrobat DC subscription, you get 5GB. This means you have 5GB of storage space available without paying a dime to Adobe. 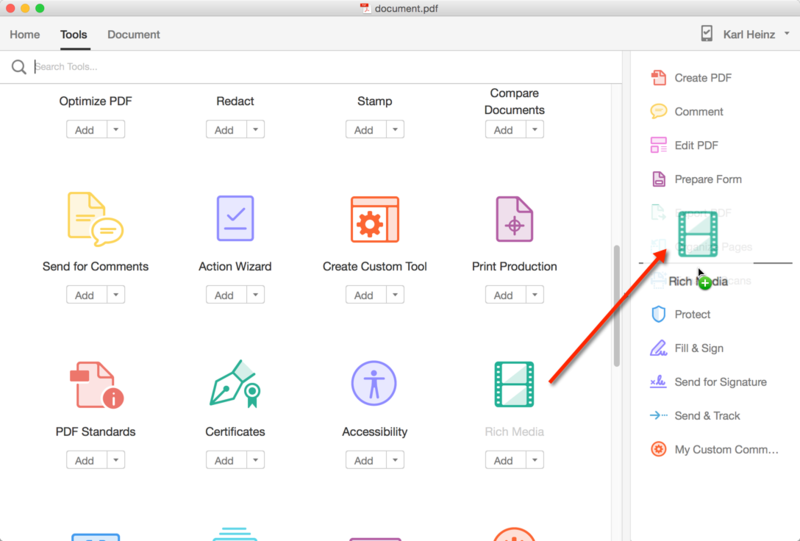 Once logged in, go to the “File” tab (2) and switch to the “Document Cloud” category (3). You can now upload a file (4) by e.g. dragging and dropping the file into the upload area. This will enable a panel on the right side that has (after scrolling a bit) the option to “Send & Track” (2). 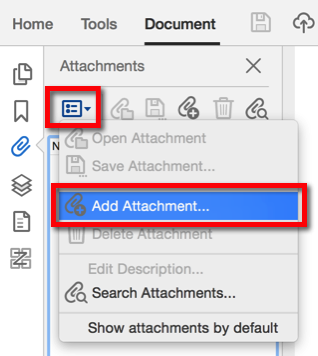 Sharing in the Document Cloud environment is called to send a file. 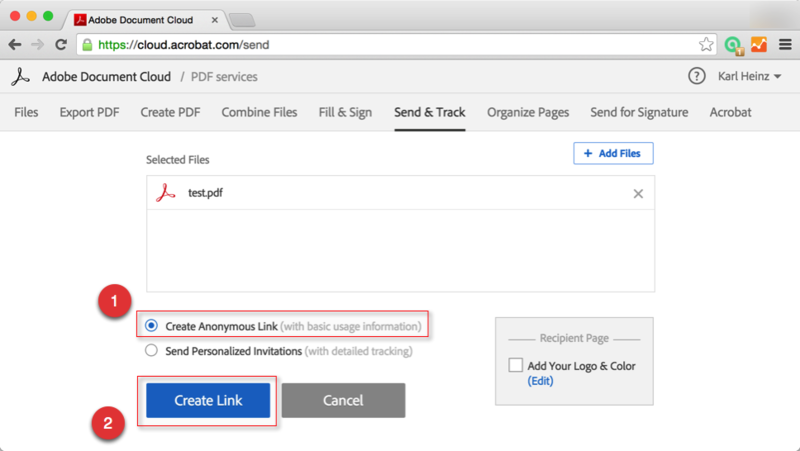 After selecting to send a file, you get the option to either share it via an anonymous link (with very limited tracking capabilities), or to send a personalized invitation with more detailed tracking. For now – because we want to share the link publicly – we select the anonymous link (1) and then click on the “Send” button (2). If you want to share a document with an individual or a small group of people, select to send via the “Personalized Invitation”, but that requires a subscription – the cheapest one would be the “Send & Track” subscription for currently $19.99/year. A while ago I documented for AcrobatUsers.com how to manually import an Excel data record into a PDF form. You can find this information here: Can I import data from an Excel spreadsheet to a fillable PDF Form? Anything I said about importing data manually in the link above is still true, so get familiar with the manual process and verify that you can actually import one data record from your text file into your PDF form. If that does not work, trying to automate this step will also fail. There is a problem with this page from the documentation: The error codes use the wrong sign: All positive values are supposed to be negative and vice versa. // processing the file. Time to exit this loop. There are two lines that actually do something: The line that is marked with ‘imports the next record’ is the one line that reads the record with the index “idx” from the file with the fielname “fileName”. And, the line with “saves the file” will save the open file under a new filename. You can get creative and use elements from the form to craete your new filename. A path of e.g. “C:\temp” gets converted to “/c/temp”. You can read up on device independent paths in the PDF specification. This should get you started. If you have questions, as usual, post them in the comments. Have you ever wanted to attach a document (e.g. a MS Word file) to a PDF document, and give the user the ability to launch that file with just a click on a button? Usually, you have to save the attachment to a file, remember where you saved it, then go to that location and open the file using your Windows Explorer or the Finder on a Mac. With the solution I am about to present, that gets much easier to do for the user, but a bit more complex for the author of the PDF file. 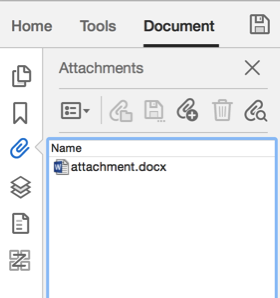 Let’s assume we have two files, one PDF file named document.pdf and a MS Word document named attachment.docx – in the following you just have to replace your filenames with the ones that I am using. I am using Acrobat DC Pro (running on a Mac) for the following instructions, this will work the same way (with slightly different tool names and a different user interface with older versions of Acrobat as well). 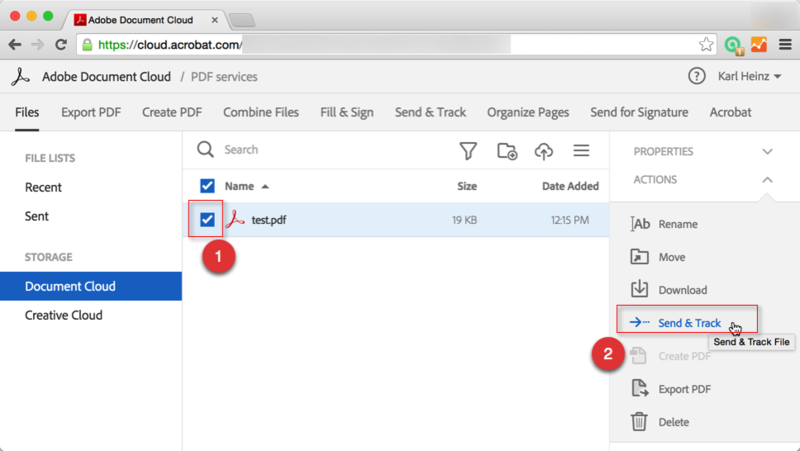 You will need Adobe Acrobat – either Standard or Pro – for this, the free Reader is not able to create such documents. So far we have not done anything special – this is just the process to attach a file to a PDF document. 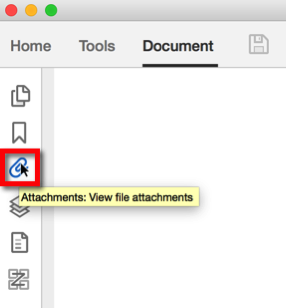 We could stop here and let the user figure out that there is actually an attachment in the PDF file, and how to open it. But that’s not what we set out to do, we want to make it obvious for the user how to display this attached document. 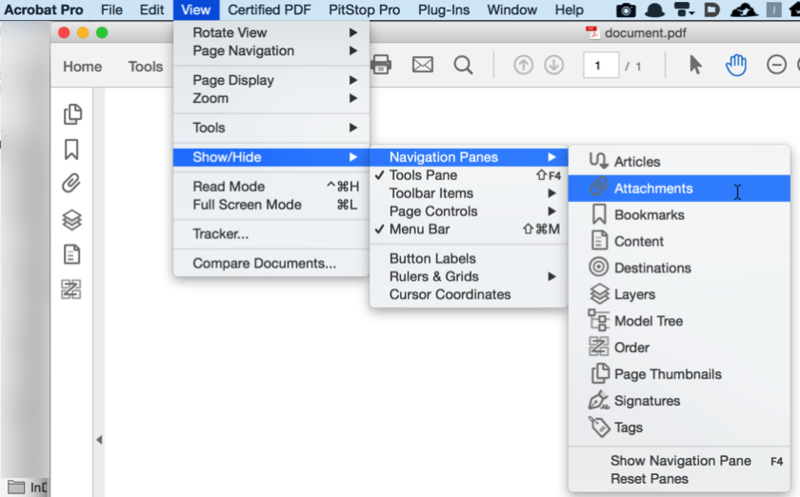 To do that, we need to add a button to the PDF document. There are two ways to do that: We can either open the form editor and then add a button (and deal with everything that comes with actually being in the form editor), or we can just add an interactive button. If this document is a form that contains other form fields, we of course would use the button function in the form editor, but if this is just one button we need to add, there is an easier way. This actually gives us two tools that we need: The tool to add a button, and the tool to select that button again and to modify it (if we need to make adjustments). For now, just click on the “Add Button” search result. 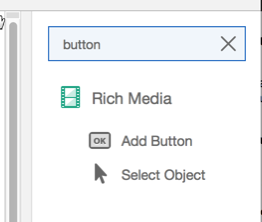 This dumps us right into the “Rich Media” toolset, with the Button tool selected. This means we can now place the button on the PDF page by moving it around to the correct location and then clicking to place it. 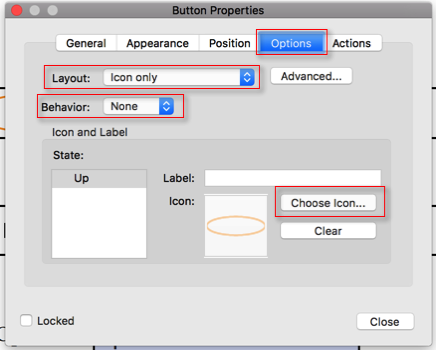 At this time, the button tool is still selected, and we can double-click on the button to bring up it’s Properties dialog. This is where we need to make changes to give this button the ability to launch the attached Word document. If the value is 2, the file will be saved and then launched. Launching will prompt the user with a security alert warning if the file is not a PDF file. A temporary path is used, and the user will not be prompted for a save path. The temporary file that is created will be deleted by Acrobat upon application shutdown. Now close the editor by clicking “OK”. A button is not very useful without a label (or an icon) on it. You can make these changes on the “Options” tab of the “Properties” dialog. 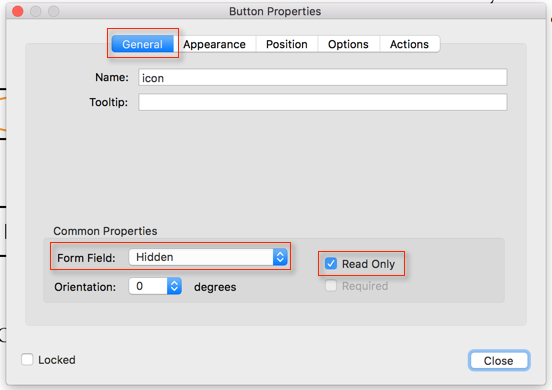 After that, close the “Properties” dialog using the “Close” button and close the “Rich Media” toolset by clicking on the “x” on the right side of the toolbar. This is it. You have a button that opens a Word document.